Choosing tile flooring for your laundry room can be a bit tricky. You will want the tile to be durable within this highly functional space, and you’ll want it to look appealing. Because the environment within the laundry room can be rather moist, and sometimes dirty, you want to choose a tile that is easy to clean and can stand up to such an environment. For a more classic appearance, ceramic and porcelain tile both fit well. Both wear well and are moisture and stain resistant. They also provide good traction, which comes in handy when soap or water are spilled. A final option is glass. Distinctive and classy, it fits well within modern homes. They are also very reflective, which makes them ideal for opening the room up and making the laundry area feel much more spacious. 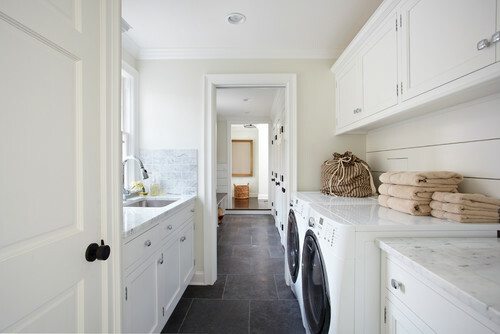 Are you choosing tile flooring for your laundry room? You don’t have to do it all by yourself. We invite you to contact us at Conestoga Tile today and we’ll be happy to offer you our assistance.